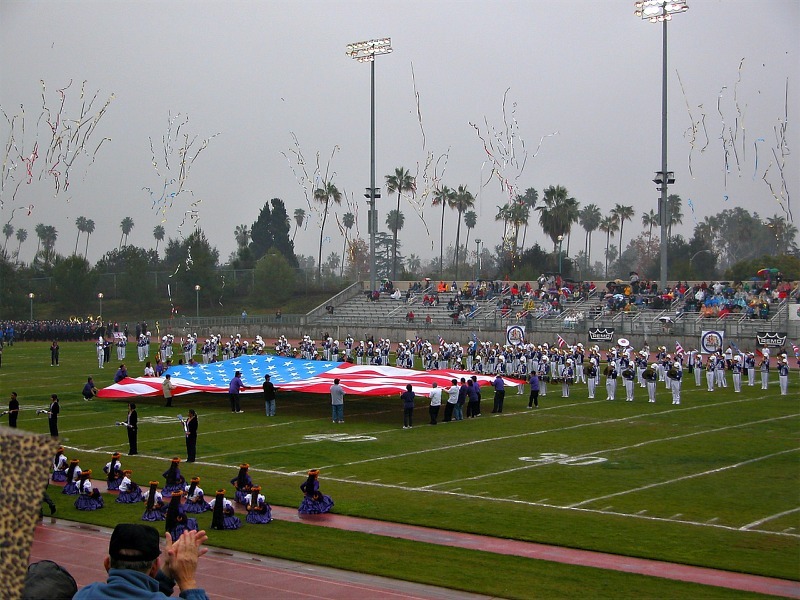 click photo to enlarge Bandfest features the bands that will be performing in the Tournament of Roses Parade. They have 3 different shows each with different bands. 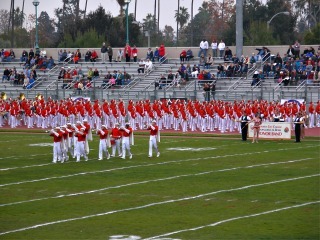 This is the Pasadena City College Honors Band with the Herald Trumpets out front. The Herald Trumpets march in the parade in front of the float with the Royal Court. 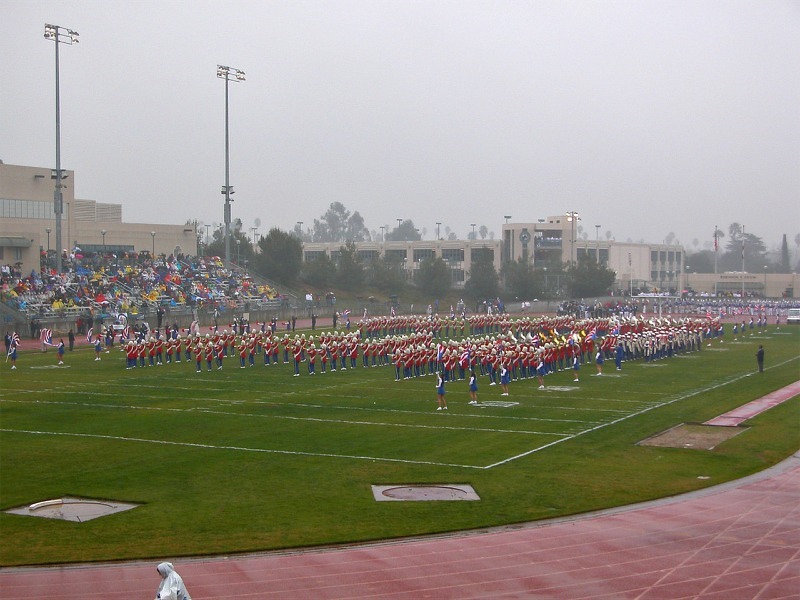 Until 2006 it had not rained on a Rose Parade since 1955. 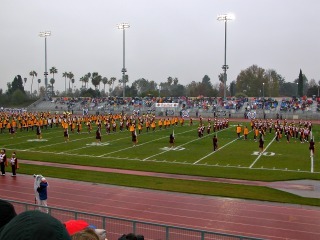 This was the first band we saw perform and no sooner did we sit down then it started to sprinkle. 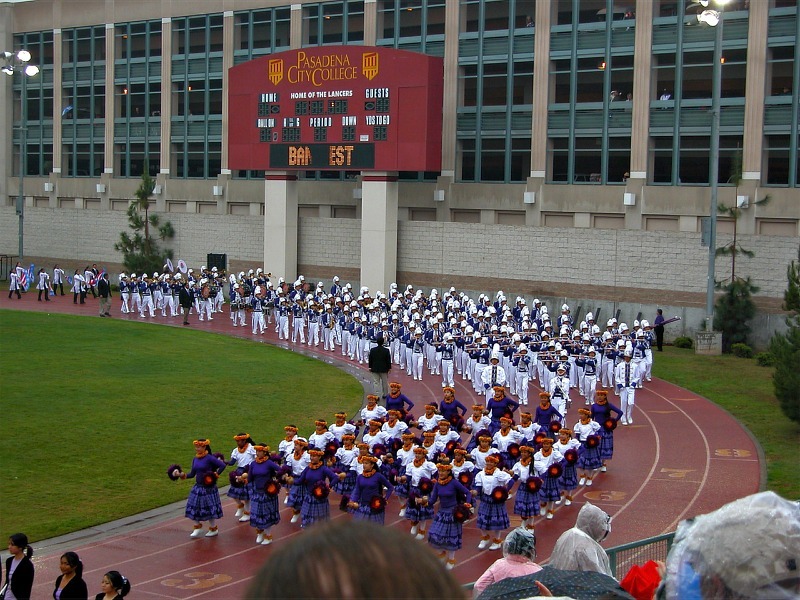 click photo to enlarge This is the USC Trojan Marching Band. 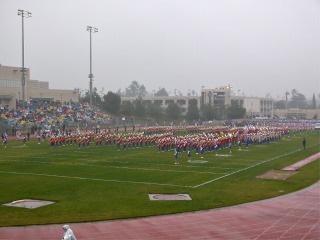 The band has over 300 members and put on a very energetic flow. I later learned they wear their sunglasses day or night. 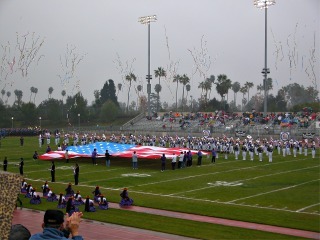 click photo to enlarge This is the Pearl City High School Charger Marching Band from Pearl City Hawaii. I think I enjoyed their show the most. The longer we were there the more it rained but it sure didn't stop these kids. Pearl City is located on the island of Oahu and the campus overlooks Pearl Harbor. click photo to enlarge This is the bands 5th appearance in the Rose Parade. They have also performed in the Macy's Thanksgiving Day Parade, Hollywood Christmas Parade, Ginza Parade in Tokyo and the annual Aloha Week Floral Parade in Honolulu. click photo to enlarge By the time this band was performing we went to the parking structure, out of the rain to watch. This is the Los Angeles Unified School District Honor Band and it is their 34th consecutive appearance in the Rose Parade. The band is 350 strong. We will probably do this again some time and hopefully next time it will be dry. 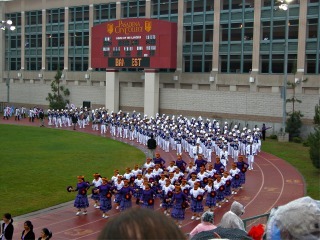 Many of the bands we saw this day were wearing rain ponchos in the parade.